Hmm. Very interesting start to a mini-series! Poison Ivy has herself involved in a mystery. She's back to working in a lab trying to get her credit back as a scientist. Harley drops by unannounced and the two go out for a drink and where Harley goes she finds trouble but Pam tells her she needs to cut ties as work is important. Only when Pam gets back to work next morning trouble has arrived there too. Great start. 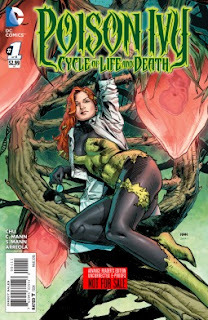 Poison Ivy is one of my favourite Bat-villains and this is cool to see her in the role of heroine for a change.